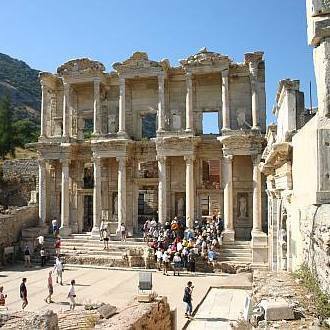 Inside Ephesus Ancient city, you are going to visit: Odeon, Domitian Square, Memmius Monument, Nike, Hercules Gate, Curates’ Street, Trajan Fountain, Latrines, Brothel, Library and the Grand Theater. It's impossible for food lovers to come to Turkey and leave without tasting shish kebab. The good shish kebab must be cooked on a large barbecue. The skewer should be crammed only with large chunks of chicken or lamb and the peppers, onions and tomatoes are grilled at the side. Any type of barbecued meat and bulgur are just best friends. After visiting Ephesus, your bbq will be ready in the village for you to cook your kebabs. You will prepare your own kebab and then cook it. Don’t miss to drink Ayran and eat bulgur prepared for you. Bon appetit.